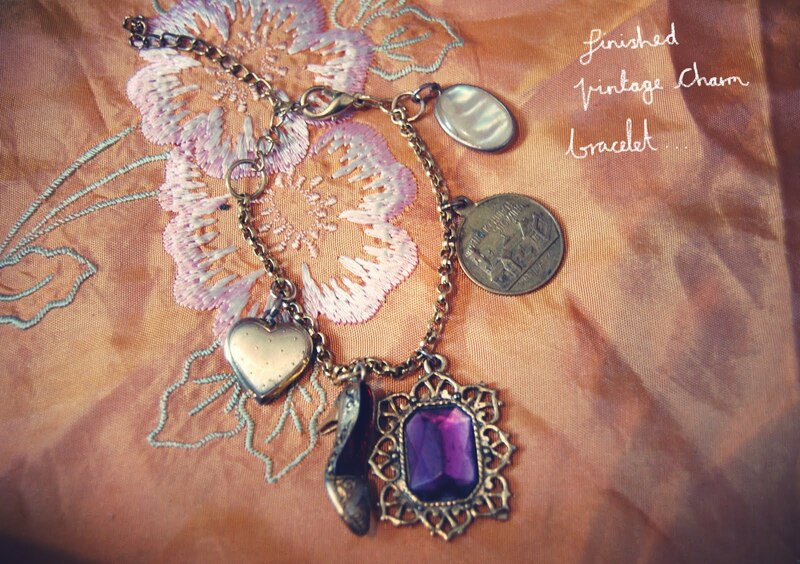 Thrifty ♥ Thursday…Vintage hand-made charm bracelet. So we are now onto our second thrifty thursday, i am so glad that lovelies liked the penny jar thrift, so much. I wanted to thank Gemma for including the thrift into her her Tuesday tips. So as you lovelies know, i am a lover of beautiful things, my totally favorite thing is making jewellery out of thrifted things. So i have decided for the this thrifty thursday i would create a thrifted vintage bracelet. So here we go lets get making my thrifty Vintage charm bracelet. 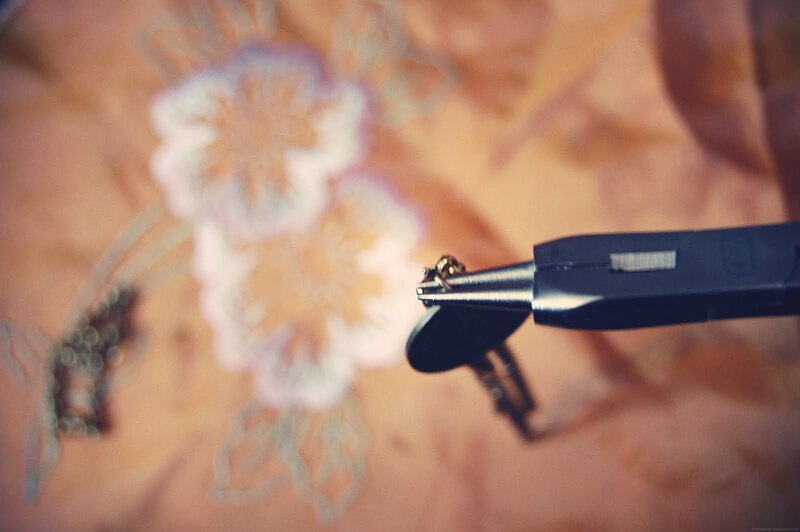 Make sure the Bracelet fits around your wrist before you start making the charm bracelet. 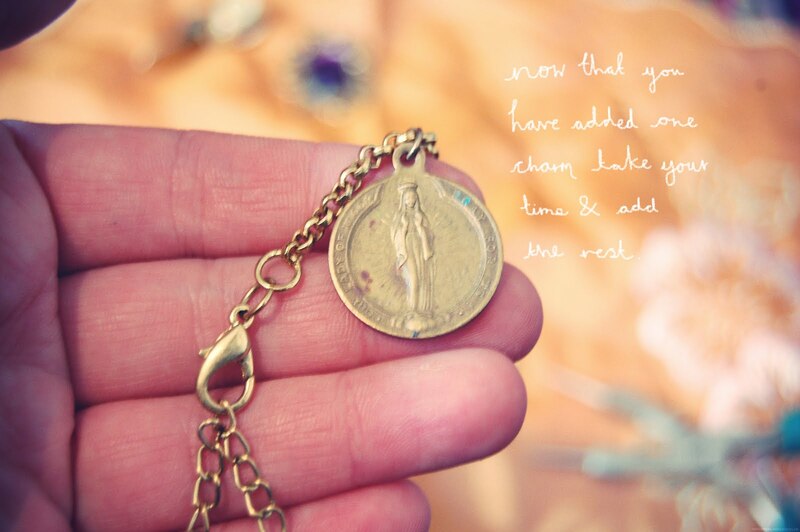 Collect up all your little charms & lay them around the bracelet, to get the arrangement Perfect. Now take a jump ring, open it up with the pliers. This can be a little bit fidally, just take your time. put the jump ring through the top of the charm, then through the bracelet loop then close it. Now repeat it so that all the charms are securely attached. It is a pretty simple thrift, and totally unique and no one will have one alike. Get thirfting. Now for the exciting twist, i have decided that this Thrifty Thursday creation is up for grabs, in my Thrifty Thursday Giveaway. 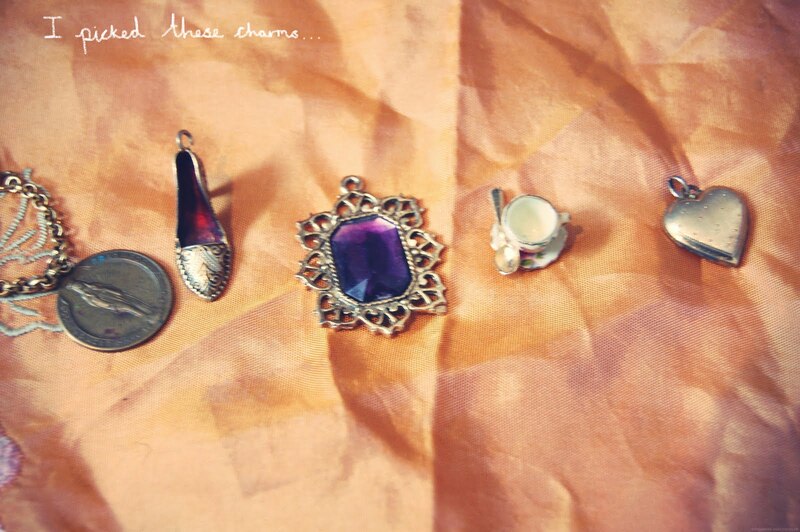 Some of these charms are real gold, so get involved in the little giveaway. Simply all you need to do is follow my blog, leave a little comment in the comment box with your email address so i can get in contact with the winner at the end. The closing date is next thursday 15th June. It is open to all reader international and uk. totally forgot my email i'm so stupid..
that is beautiful. charming bracelet indeed. This is amazingly beautiful. Each charm is just more beautiful than another. 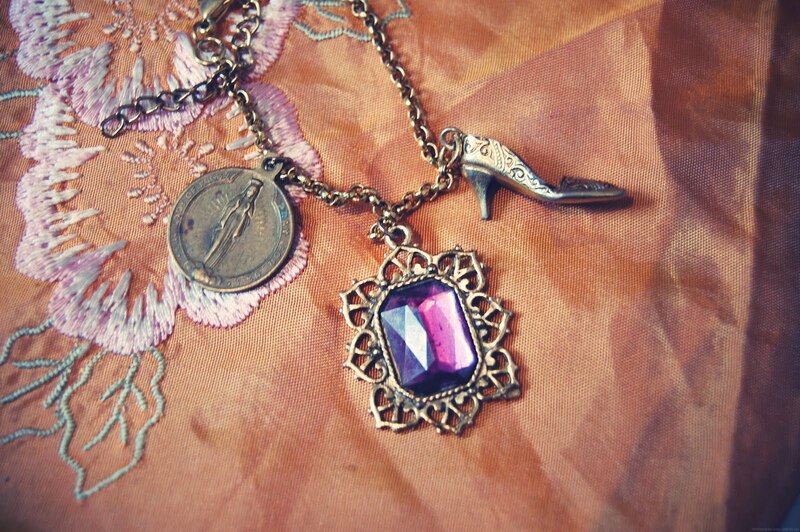 That is really pretty the purple charm is lovely! I would love to win one and maybe make one anyway. I love the one you've created, the charms are all so lovely! The bracelet is so pretty!! My oh my… this is just lovely, wish I had the patience to make something so pretty! This is so clever and a great way to save some pennies. 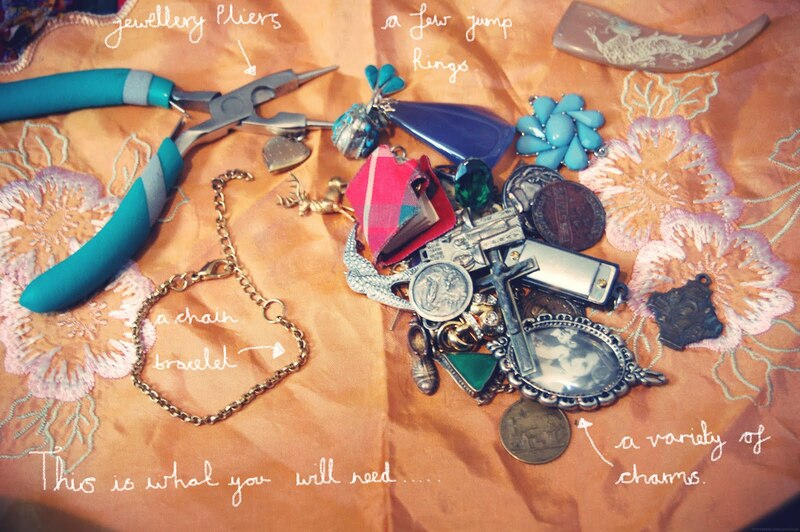 this is so cute, i have loads of random broken jewellery and charms that would be perfect this sort of thing. Such a good idea and the end result is so pretty! Lovely idea for a giveaway! Aah Ella this is so lovely 🙂 I'd love a chance to win please! oh how lovely, i so love all the things you make – you are incredibly talented ella! Oh wow that bracelet is a beauty!! This is amazing – you're so crafty! This is such a good idea!! I shall certainly try to make a bracelet like this:) Thanks for all your inspiration, Thrifty Thursday ROCKS! lovely jubly, this is a great thrifty thingy! can't seem to get my words right today? This is beautiful love those charms!!! i am so in love. this is amazing! oooh lovely. what a cute idea. you inspire me to go to our town's bead store. I've just found your blog through gemfatale's tuesday tips. Oh wow this is such a simple but fab idea that I would never have come up with myself! This is so lovely. I completely follow and would like to enter. This is such a lovely giveaway. 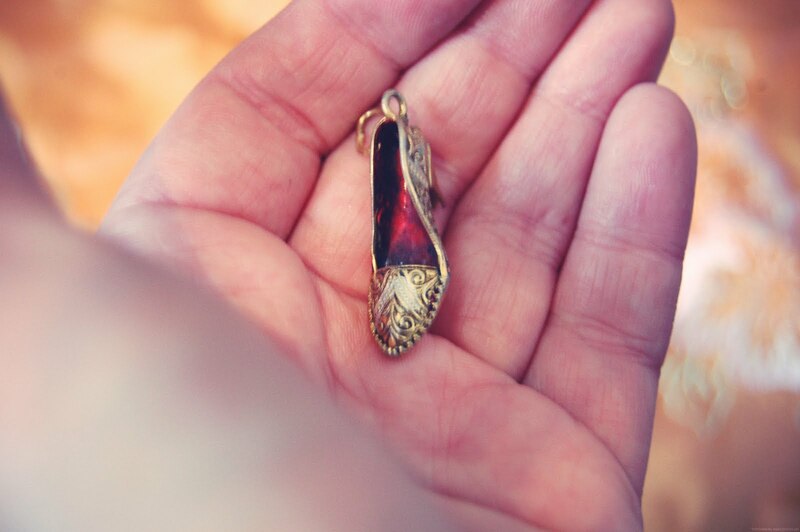 The little shoe is so beautiful and the one with the purple stone is like something from the Tudor times . I would love to win this…..Pretty Please 🙂 I would wear it tons. I forgot to give my email address…. oh wow this is lovely!! Amazing! 😀 Where do you buy yuor materials from? the bracelet is so lovely! I loove these bracelet, you've inspired me to be crafty and dig out some charms!! that is the msot gorgeous bracelet ever! so pretty, and I love that it's so unique! hope I'm not too late to join! i only follow yours and GemFatale's blogs on here and must say I am so INSANELY jealous of both of yours' styles.. I literally look like every other Primark/H&M mannequin..
We only have a few charity shops and none of them have anything that is vaguely inspiring.. I won a goorgeous french vintage shirt from ebay and think the bracelet would compliment it beautifully!! I have to ask where you got the charms from, they are amazing! This is a wonderful idea. You are so creative and thoughtful in your work. I think the bracelet is just lovely. I'd like to enter if it's not too late, otherwise I just wanted to say how cute I think your bracelet is.